In recognition of Karen Fraser’s decades of service and long list of accomplishments, the area’s Woodland Trail that runs through Lacey and Olympia was recently renamed Karen Fraser Woodland Trail. 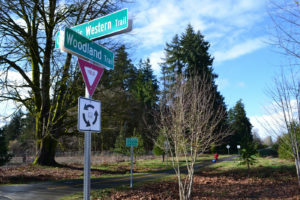 The City of Lacey noted that the Trail’s new name was a fitting tribute for someone who has been a “trailblazer” from Lacey to the state Capital. A prime example of Karen’s extraordinary leadership skills was her work with the Nisqually River Basin Task Force, formed to protect the 80 miles from the Nisqually Glacier on Mount Rainier to the crown jewel of the Nisqually Delta. As chair of the Task Force, Karen oversaw the successful collaboration of many interests to forge a plan for the protection of the entire Basin’s precious natural, cultural and economic resources. 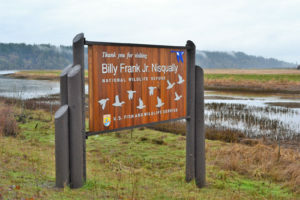 “I realized just driving here today, I have been involved with the Nisqually Delta one way or another since shortly after moving here,” Karen explained looking out a wall of windows from the auditorium of the Norm Dicks Visitors Center at the Billy Frank Jr. National Wildlife Refuge. She arrived here 51 years ago to be an intern in the State Legislature and eventually worked as an assistant legislative liaison for the state Highway Department and Jay Butts, someone well acquainted with the leaders of the “Save the Nisqually Delta” movement, an army of citizen advocates working to protect the Delta from industrialization. The group invited her to some of their meetings. 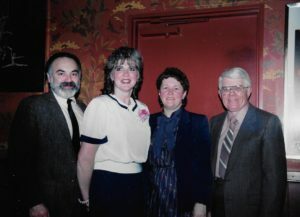 Karen later began her public service as one of the first three women appointed to the Lacey City Planning Commission. In just two years, she was appointed to the Lacey City Council to fill a vacant seat and in January of 1976, she became the first woman Mayor of Lacey. “The headline on the front page of The Olympian the next day was ‘Lacey Takes a Ms. Mayor,’” Karen noted with a smile. After seven and a half years on the Council, five as Mayor, several friends suggested that she run for an open seat on the Thurston County Board of County Commissioners. She admitted she was hesitant. It was during her years as the Thurston County Commissioner for District 2, where the Nisqually River lies on its border, that she chaired the task force charged with developing a plan to protect its basin. 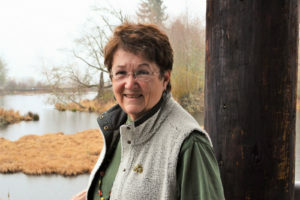 In Karen’s second term as a county commissioner, then State Rep. Jennifer Belcher passed legislation in 1985 calling for a Task Force to develop a plan to protect the Nisqually River Basin. The state Department of Ecology was to staff the work and their consultant, Milt Martin, asked Karen to lead the task force. “The people appointed to this task force were a-team, top of the line, representing every public or private sector that was reasonably involved, some local, some regional,” said Karen, who often credits the work of others. The first few meetings, Karen describes a palpable tension due to concerns over the possibility of new government regulations and use of property. She said Bill Bush from the state Parks Department had “a brilliant idea” to pass early recommendations to ease the tension and set the tone for the planning process. They agreed not to recommend new government regulations, any new government structure or the use of eminent domain. Afterwards, Karen said the concerns dissipated and everyone started working together. There were monthly meetings, public testimony, lots of data and tours up and down the entire basin. 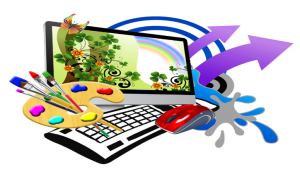 The work of the task force needed to represent the balance of all interests. 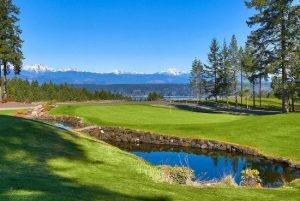 Approved by the Legislature, the final plan established the Nisqually River Council that to this day, helps implement the plan. Karen, the Council’s first chair, said it has no authority, but is a jawboning and advocacy group that makes recommendations to those responsible. The Nisqually Land Trust was also created to acquire and manage critical lands of the Nisqually River Watershed. Karen was a founding Board member of the Nisqually Land Trust. An avid outdoorswoman who has summited four of the Northwest’s tall peaks and has sailed competitively, Karen deeply appreciates the environment, but says her primary motivation is people. 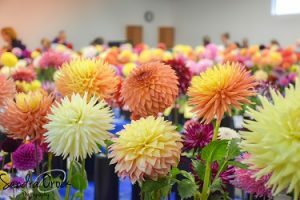 “If you care about people, you care about their dependence on the natural world—on water, food and resources for shelter and medicine,” said Karen, who also leads Earth Ministries at her church. After serving as a county commissioner, Karen was elected to the Washington state House of Representatives for District 22 and then to the state Senate where she retired in 2016 after six terms. 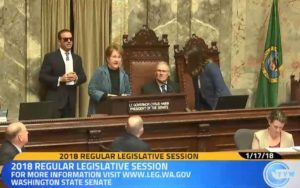 Sen. Karen Fraser was recently surprised with a tribute from the Senate floor (view here on TVW). Heartfelt comments were offered by senators from both sides of the aisle, as well as by Gov. Jay Inslee. 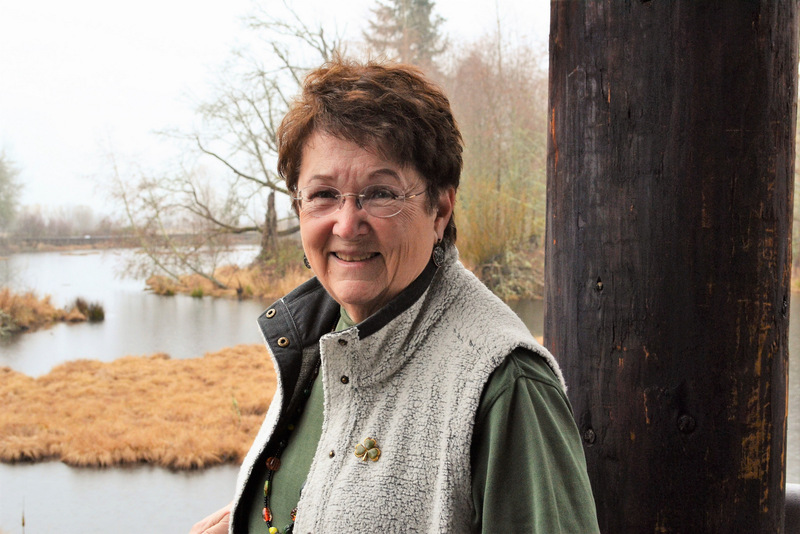 Karen Fraser has been a true trailblazer with decades of devoted service to our area and state that include her remarkable work for the Nisqually River Basin Task Force.